We all love the way our hair feels and looks after a blowout and want to make it last as long as possible. We’re here to help! Learn how to make a blowout last, as well as things you shouldn’t do. Kimberly Gore Salon is Columbus, Georgia’s best hair salon, offering blowouts, color, cuts, extensions, locs, braiding, and more. Contact us now to make an appointment! 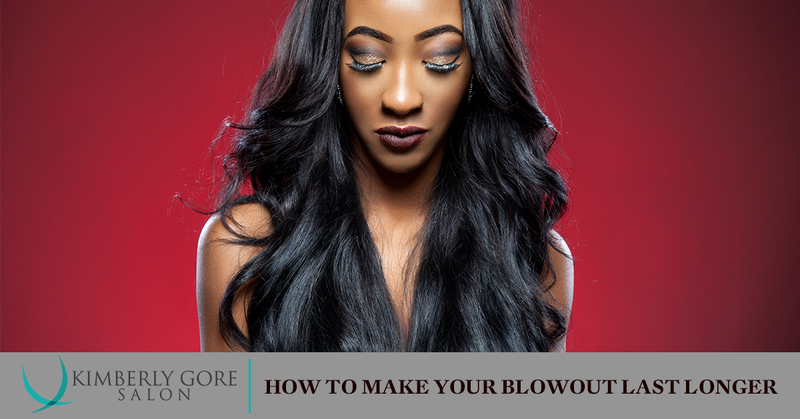 Here’s what you need to know about making your blowout last! The natural oils from your hair will build up if you haven’t washed your hair, and after a blowout, it’s possible you’ll want to go as long as a week afterward without washing. Dry shampoo absorbs oil and dirt, as well as other products you’ve used. Spray it on your roots, and lightly throughout the rest of your hair. Use a paddle brush (or one your hair stylist) recommends to distribute the dry shampoo. Invest in a good-quality, comfortable shower cap and make sure it covers your hairline as well. Even if you make an effort to stay out of the water without wearing a cap, the steam will permeate your strands and undo all that gorgeous work. When you wash your face, wear a thick headband that covers your hairline. Your hair stylist likely put in a shine product when she gave you the blowout, but after a few days, that shine is likely a bit…lackluster. Ask your hair stylist for a personalized recommendation for a shine-enhancing product that’s lightweight and designed to be used on hair that’s been given a blowout. The best hair salons will be ready to go with product recommendations! Your fingers carry oils, and since you’re trying like mad to avoid oils, you should avoid touching your hair. If you’re constantly touching your hair or playing with it, you’re going to make that blowout go away. And if you’re a hand lotion wearer, you’re going to make the situation even worse. The moment you put it in a ponytail or in a bun, you’re going to create kinks that won’t go away easily. Your hair stylist will let you know, based on your hair’s natural texture, how to keep it out of your face when you need to. When in doubt, ask your hair stylist for a rundown for blowout aftercare. For all your hair needs, turn to the best hair salon in Columbus. Call Kimberly Gore today!